Search Results for "raining on street"
HONG KONG, OCTOBER 2015: Traffic in Hong Kong with double decker tram and people carrying umbrellas in the rain crossing street in Causeway Bay. 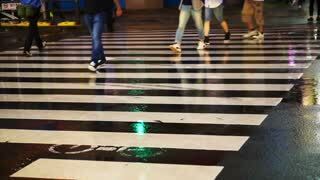 Girl walking through flood water on street after raining, slow motion.Girl walking through flood water on street after raining, slow motion. Heavy rain in a suburban street. Spring humid rain. People walk with umbrella during raining day at street.